The Spring framework is a popular choice for developers when designing an enterprise-based application. Get set for an incredible journey. 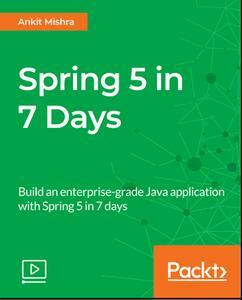 This course is your one-stop guide to learning and building applications using the Spring framework in 7 days. The Spring framework enables developers to create high-performing, reusable, easily testable, and loose coupling enterprise Java applications. It can be used to develop any Java application. By the end of the course, you'll have a solid knowledge of the Spring framework and modules and will be able to build enterprise-grade Java applications in 7 days.